Admission is free. Pie by the slice, ice cream, and drinks available for sale. This annual event continues to delight. 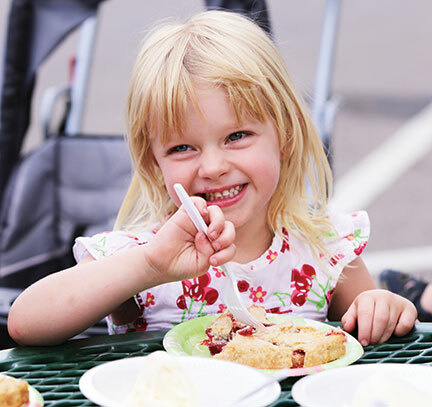 Enjoy delicious cherry pie and tasty ice cream while listening to live music and browsing vendor booths. Children’s activities, historical displays, and a cherry pie contest make this an evening to remember. Sponsored in part by Visit Loveland, Loveland Barricade, Perkins, IScream, and Daz Bog Coffee. Category winners will be announced at 7 pm. texture, taste, and overall appearance. Commercially baked pies are not allowed. All pies must be prepared within 24 hours of the 4:30 pm deadline. Join the Loveland Historical Society at their on-site booth and learn about the history of the cherry as it relates to Loveland, from orchards to canning to the annual Cherry Pie celebration.